Experience a Roman legionnaire from a colored Schreiber cardboard kit. 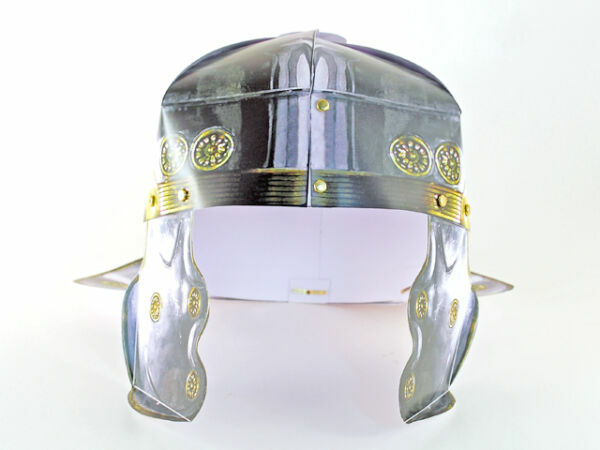 The legionnaire measures 22 centimeters in height. May only be used under the supervision of an adult. Provide this brave legionnaire with a new home! At least since the end of the marcomannic wars and subsequent military reforms the original imperial legionnaire of the heyday of the Roman empire is believed to have become unemployed. Give him a new activity field and let him secure your bookshelves, thus giving him not only a job but also a destination and a worthy home. He is not only fully equipped but had a throughout training which makes him suitable for any combat or guard mission you may order him to perform. 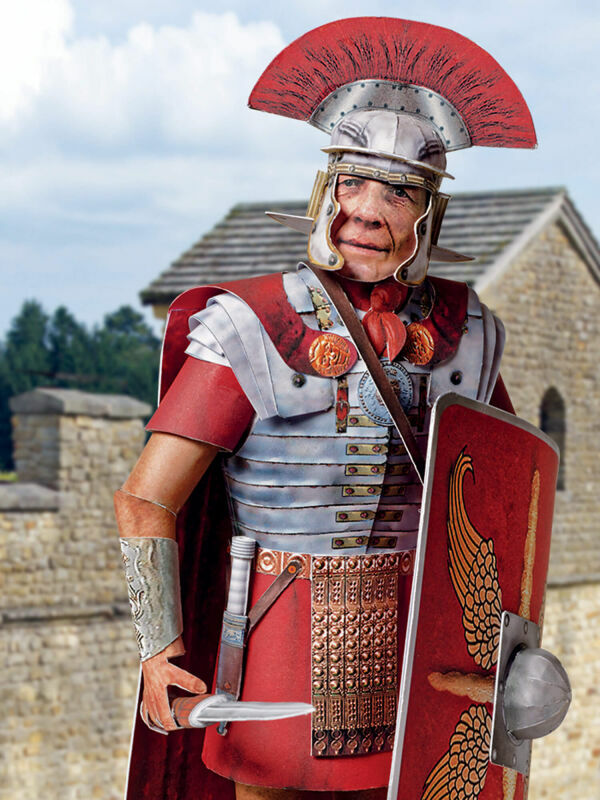 This cardboard kit Roman legionnaire enables you to recreate a realistic looking legionnaire in simple and easy assembling steps. 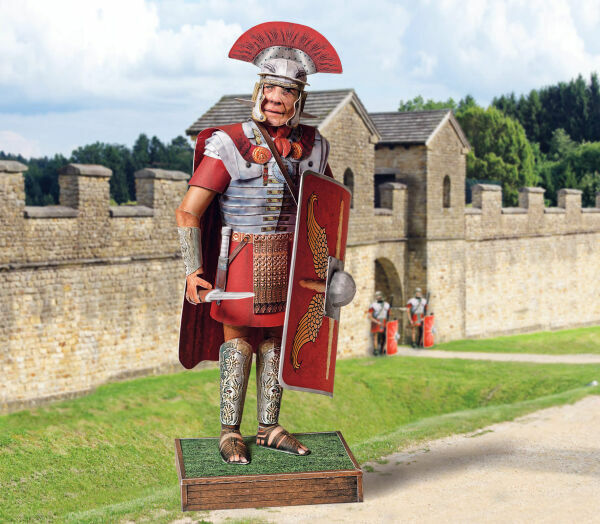 What you will get is a Roman legionnaire of the high imperial period, clearly showcasing his body armor, the ‘lorica segmentata’, and his helmet, the imperial-gallic type as found in Mainz-Weisenau. The heavy infantry soldier is equipped with the typical weapons of his time, consisting of the short sword ‘gladius’, his javelin ‘pilum’ and his rectangular shield ‘scutum’. 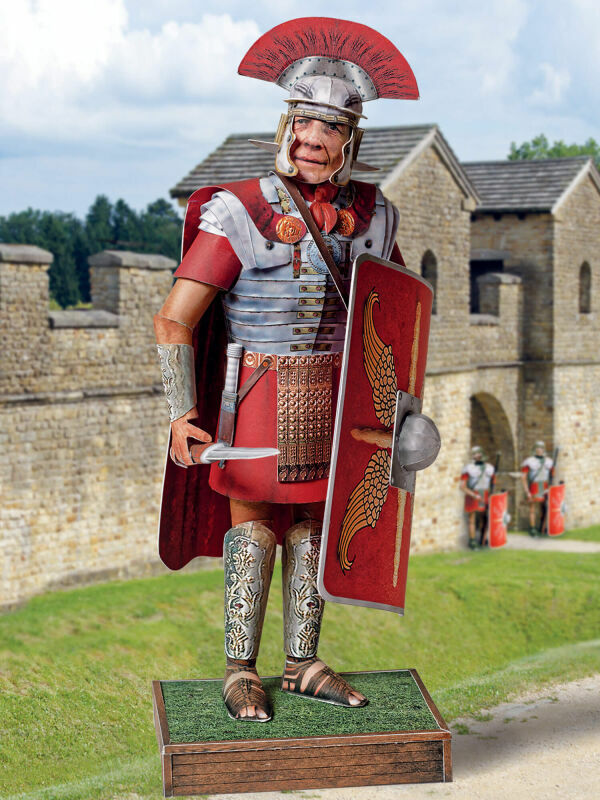 All this is presented to you by the cardboard kit Roman legionnaire, resulting in a depiction of legionnaire ready for combat but standing in neutral position. 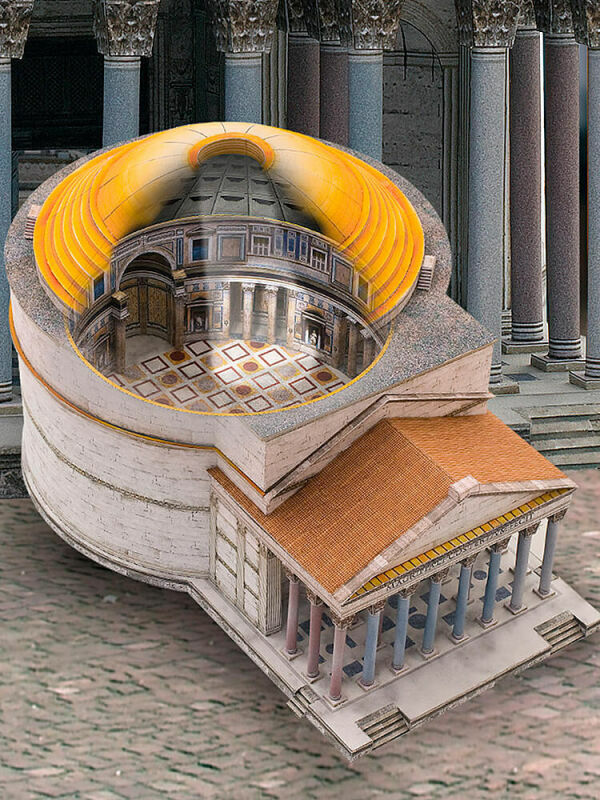 When you are thinking of the Roman empire, you probably have on your mind the coliseum, Julius Caesar and the picture of a typical legionnaire in his lorica segmentata wearing an imperial-gallic helmet. Most films, books and comics depicting the Roman empire will present you the looks of this classical legionnaire. But in reality the military was constantly changed by reforms as they happen in modern times. Have a comparative look at the changes in the equipment of a soldier of your country within the last 150 years and you will most likely find big differences. Like this the picture of a professional soldier of the Imperium Romanum never ceased to evolve according to experiences, doctrines, fashions demanded by high command. For example, once an emperor (Caracalla) tried reequipping full three legions with long macedon sarissas (extremely long pikes) because he admired Alexander the Great and expected similar effect fighting the Parthians in the east 216 AD. Our cardboard kit Roman legionnaire lets you assemble a foot soldier how he looked like around 100 AD. It was the time when the Flavian dynasty came to an end and the situation at the borderlines of the realm was rather calm. 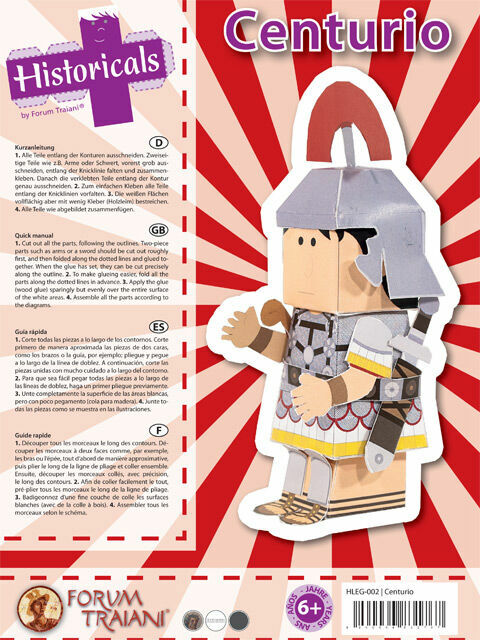 The assembly of this cardboard kit Roman legionnaire is suitable for children and adolescents from 10 years of age. For making sure the result is most pleasing it is advisable to take a look over the shoulder of your little drill centurion and give a hand, if necessary. 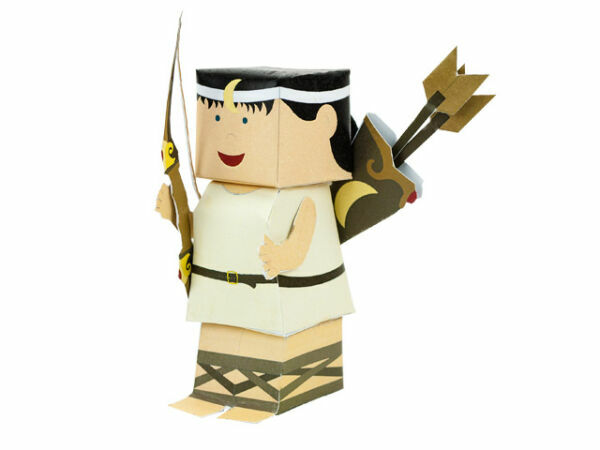 The cardboard kit Roman legionnaire is reckoned to be of medium difficulty and needs some skill in accomplishing the task. 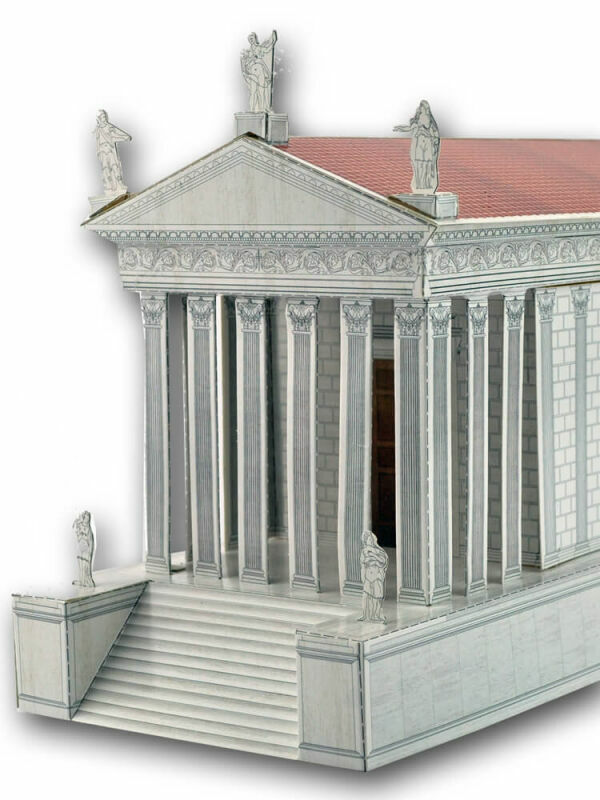 Once completed, the legionnaire will serve well for lasting fun.